Woods & Aitken LLP, along with Lincoln Human Resource Management Association and Lincoln Journal Star, invite you to attend Lincoln's 2019 Best Places to Work awards luncheon. This celebratory event honors Lincoln's top businesses that have created positive work environments for their employees. Find out about their company philosophies and learn how they keep their employees happy! 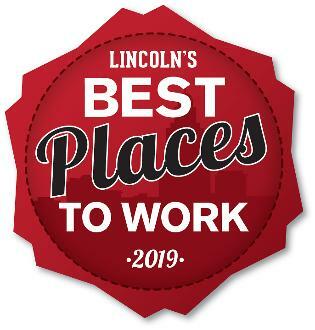 Winners were determined based on the results of the Best Places to Work in Lincoln survey conducted in early 2019. Don't miss this chance to network with these innovative companies and learn what it takes to be one of the Best Places to Work in Lincoln!